So far, investigation has failed to discover the details of the row, except that it is clear from other parts of the diary that it was still raging in 1846. However, the ‘Witham fires’ were recorded fully in the newspapers and other records of 1828 and 1829. This makes it possible to study them in considerable detail, and there is therefore an opportunity to view the fires in the context of the time and place in which they occurred. As a result, an apparently random series of sensational events can be seen to have some more general significance. The particular episode and the historical background can each illuminate the other. This study will therefore amplify the details and the circumstances of the Witham fires in the hope of achieving such illumination. Section 2 will discuss them from the point of view of law enforcement, and Section 3 will deal with some aspects of the society in which they took place. First, however, there will follow a summary of the historical context, and a brief description of the actual events at Witham. It was in this context that a wave of arson began at Witham in November 1828. A full account of the affair could occupy a whole book in itself, so that this section will merely attempt to outline the main events. The Select Vestry was the elected body responsible for distributing Witham’s poor relief from the income provided by the rates. From 1822 it sought to control its spending.14 1828 saw the first of a series of three poor harvests, and the price of wheat shot up from 60 shillings (£3) a quarter in September to 72 shillings (£3.60) in October.15 This was the highest price since 1820, and it remained above 70 shillings (£3.50) until June 1829. The increase seems to have caused remarkably little comment at the time, but then the farmers were usually quicker to draw attention to low prices than to high ones. Late in 1830 a wave of protests by farmworkers began in Kent, and spread to the whole of south-eastern England, far exceeding any earlier movements in their scale. They included arson, riots, machine-breaking, and the threatening letters, often signed ‘Captain Swing’, which gave the protests their name.59 When the Royal Commission on the Poor Law sent out a questionnaire to parishes in 1834, it included a question about ‘the causes and consequences of the Agricultural Riots and Burnings of 1830 and 1831’. Two of the respondents from Witham disagreed about whether unemployment was to blame; it was the magistrate William Luard who thought it was. The third respondent was the vicar, Revd John Newman, who said firmly that, ‘there were no Burnings or Riots in Witham Hundred in 1830 and 1831’.60 In the circumstances this was perhaps being economical with the truth. The last section described the progress of the Witham arson suspects towards their fate. Now the significance of this progress will be elaborated in relation to the legal framework in which it took place. It will be seen that the law was not a detached entity, because its use depended on the requirements of the people involved in it. Furthermore, it was constantly developing in response to those requirements. For guidance, the procedures involved have been illustrated in diagrammatic form. The 1820s may be seen as a transitional period in the development of attitudes to the criminal law. Historians dealing with the time before the 19th century tend to stress that much so-called ‘discretion’ was extended to suspects.65 The operation of the law was largely in the hands of private individuals, who used it as a tool of social control. Potential maximum punishments were very severe, but frequently they were not adhered to in practice, and served mainly as a threat. In contrast, historians who write about the later 19th century stress the development of a new approach.66 It became the ideal that as many suspects as possible should be caught and punished, in a systematic way. To make this more feasible, the law was amended so as to reduce potential penalties to a level which was likely to be used in practice. In particular there was a reduction in the number of offences for which the death sentence could be inflicted. In an attempt to achieve the new aims, public intervention was increased. Thus during the 1820s, some tension and confusion can be expected between the use of discretion and the hope of certainty, and between private and public participation in the law. If the grand jurors found a case fit to proceed, they awarded it a ‘True Bill’, and it proceeded to open court to be heard in public. There the Petty Jury was responsible for giving a verdict on the guilt of the suspect.98 It was regarded as normal for this jury to act on guidance from the presiding judge or magistrates; when the jurors at Edmund Potto’s trial did not do so, the judge found their behaviour ‘unintelligible’.99 But Henry Hobhouse, Permanent Secretary at the Home Office, wrote in his diary in connection with the Cato Street conspiracy in 1820, that ‘in this self-sufficient age … juries are not content to take the law from the judges’.100 So in fact the petty jurors may be added to the lengthening list of people whose discretion could affect the outcome of a prosecution. In 1824 and 1829 Essex Petty Juries gave a verdict of ‘not guilty’ to twenty per cent of the charges that came before them. A further nine per cent were dropped because the suspect had been convicted of other offences on the same occasion. Many of the decisions must have been somewhat hasty. The jurors normally did not leave the court room, and in 1824 and 1829 they had to consider an average of 42 cases per day at Quarter Sessions, which only lasted one day, and 21 per day at Assizes, which lasted about a week.101 Thus the first hearing of Edmund Potto’s case at Witham was extremely unusual in taking all day and in having a jury which retired from the court room.102 Also exceptional was the challenge by Potto’s counsel to the farmer jurors, who had to be replaced by tradesmen; no other challenges were found during the 1820s. The challenges for Potto were probably wise, because there are indications that farmer jurors were more severe than others, quite apart from the fact that they were likely to be particularly hostile to arson. It also seems that the compilation of jury panels and the selection of jurors by the Sheriff and the Clerk may not have been entirely random; there was a tendency for farmers to be better represented at each stage than one would anticipate.103 Hence discretion could be influential even in jury selection. Crime has attracted the attention of historians for its own sake, as discussed in the previous section. But because of the volume and detail of the records it has generated, it is also of historical value to those whose interests extend into society as a whole. Personal documents such as household papers and ephemera only survive very rarely. In their absence, people can only be studied when they come under other particularly well-documented spotlights, such as those of the criminal law. Thus episodes like the Witham fires provide invaluable source material for the study of many aspects of social history. This section will discuss three such aspects as examples. They are the tensions between national and local interests, the relationship between the poor and the prosperous, and the status of ‘strangers’. This last reaction has particular relevance to the Witham case, in illustrating that the people with most status, and closest to the reins of power, were those least in a position to be aware of real local tension. Thus at Witham, Western, the Member of Parliament and link man, may, like Viscount Maynard, have been somewhat remote from local feelings, and, in his case, from the acute local consternation caused by the death sentence on James Cook. This may have contributed to his apparent ineffectiveness when he visited Peel at Luard’s request to plead for the life of Cook. Another factor was that his visit was on the same day as the Second Reading of the Catholic Emancipation Bill, on which Peel was undergoing a dramatic change of heart; this was to affect the personal reputation of which he was very proud.127 James Cook must have seemed a minor local difficulty in comparison. 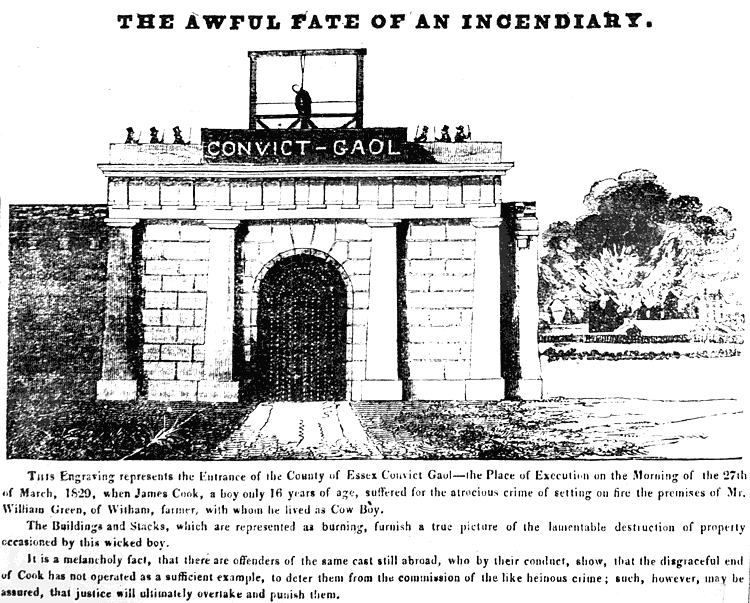 The Witham fires were fairly typical in the sense that two out of the three main suspects were labourers, and that the prosecutors were farmers and tradesmen.135 In Essex, the available information for 1824 and 1829 shows that 63 per cent of Assize suspects were described as labourers, and 80 per cent of Quarter Sessions prosecutors were non-labourers.136 A high proportion of recorded crime therefore took place in the context of relationships between the poorer and the better-off members of the population. The circumstances of the fires in 1829 highlight questions about this relationship, particularly within the farming interest. Some of those questions will be discussed here. An equally common scenario which was put forward in the 1820s, was that the whole agricultural interest was suffering together; particularly as a result of low wheat prices. Thus the Chelmsford Chronicle felt that the reason the farmworkers were poor in 1829, was that ‘those who ought to employ them are deprived of the means of so doing’.152 A Select Committee witness said that in Suffolk, ‘whenever corn has been the cheapest … the labourers have been the most pressed upon, by their inability to procure the necessaries of life’.153 However, several factors, including the circumstances of the Witham fires, suggest that in reality there was an opposite relationship between prices and crime, namely that crime was aggravated by high rather than low prices. For example, in the winters of 1823/4 and 1828/9, there were two sudden leaps in prices, which co-incided with marked increases in the occurrence of recorded offences, even above the usual high winter level. The second one included the beginning of the wave of arson at Witham.154 This may be explained by the fact that wheat prices did not actually affect all participants in agriculture in the same way. Low wheat prices naturally distressed the farmer, but as they arose from the over-production of a good harvest, they often meant more work for the farmworker, as well as cheaper food. Conversely high prices, and high profits for the farmer, arose from shortages of corn and of work, and caused expensive food. So there was not as close a similarity in the interests of farmers and their workers as the farmers liked to believe. Furthermore, the witnesses and even the prosecutors were very frequently from other parishes, so that perhaps less than a fifth of cases entailed people prosecuting others resident in the same parish as themselves.167 One specific indication of the tendency to suspect people from other areas, is the regular annual increase in recorded crime at harvest time.168 This was when farmworkers and others travelled about the county for work, particularly in view of the later harvest in the northern parishes.169 Needless to say, one place’s stranger was often another place’s beloved son. This was indicated for instance by the willingness of a Cressing farmer to take back his carter William Killock who was convicted of stealing coal at Heybridge in 1824.170 And at Witham, Edmund Potto did have his friends, in spite of the general enthusiasm of the prosecutions against him. The unusual pressures may also be illustrated by the fact that one of the prosecutors of the period was Latimer Dell, a Quaker miller from Earls Colne.172 As already mentioned, in normal circumstances Quakers were reluctant to prosecute. It was noticeable that after the brush yard and the drill yard closed in the 1870s, Witham was to have no major manufacturing employer of men until 1919.199 Local tradition holds that this was due to deliberate exclusion tactics by local employers and property owners.200 This may seem far removed from the problems of arson in the 1820s. But if it is true, it does echo the attitudes of that period which seem to have been highlighted by some aspects of the Witham arson trials. There were no comments in 1907 about the sensational circumstances of the original purchase of the fire engine, which seem to have been forgotten. However, in the 1970s local writers began to rescue the Witham fires from oblivion, and to draw attention to their sensational character.202 They have been seen as an isolated and exceptional incident, and in some ways this is what they were. It might therefore appear that their oddity makes them meaningless historically – a so-called ‘monomaniac’ could embark on a fire-raising spree at any time – and not be seen to have any great significance. It must be admitted that it is really only the depth of reporting and the extent of record survival that make the fires interesting today. Without this they would have been just another unexplained few lines in the newspaper, or in the diary of Robert Bretnall with which this study began, and they would be as mysterious as the argument between Bretnall and ‘old Martin Brunwin’ which appears in the same entry. But although the wealth of information may be untypical, it is very enlightening in many ways, and some of them have been discussed in this study. Often it is the contemporary comment about how unusual something was, that provokes questions about what was normal, and suggests fruitful areas of investigation. This particularly applies to the legal process discussed in Section 2, where it was suggested that the 1820s were a transitional period. On the one hand there was the force of local and personal discretion which had been dominant in the 18th century. For instance, the victims had first to determine whether or not an offence had actually taken place. John Crump and James Catchpool at Witham eventually decided that their fires on 5 November 1828 were not after all activated by fireworks but by an arsonist; it was only three weeks later that further fires seemed to confirm that decision. They then had to consider whether to take action, and had many opportunities to stop or continue with it before the trial in August. James Catchpool decided not to proceed, perhaps for religious reasons, but John Crump was left with little choice but to hunt the arsonist, because of the wave of feeling that overtook the town. This same anxiety seems to have spread to other parts of the county, where prosecutors rounded up old offenders. They also took people to court whom they might have overlooked at other times, who were thus very much the victims of chance. Some of them may even have been people of good reputation, unlike the ‘bad characters’ who usually became suspects under the powers of discretion, because of the absence of other information. However, the anxiety generated by the fires also activated a more significant move against reliance on character alone in the furtherance of a prosecution. This was the recourse to new ideals of certainty and public and professional action, to supplement the force of suspicion. These were only in their infancy in the 1820s, and were to develop further to become the norm during the rest of the century. In particular, Witham saw the energy and application of the magistrate William Luard. In seeking evidence he sought information about matters such as the whereabouts of the suspects, and the availability of firelighting equipment, in a way which was much more like the systematic police approach of later years. This led him to James Cook, a suspect who did not have bad character. Cook’s trial might therefore be seen in some ways as a confrontation between the new and the old, as there he faced a judge who used the ‘old-fashioned’ powers of discretionary severe punishment. Many other aspects of the episode would need wider investigation before one could be sure of their position in the history of the law. For instance, the question of a probable bias in the selection of juries, and in their decisions, is not one that seems to have been given any great attention. Similarly, the challenge of jurors by a defendant, as was done in the Potto case, and the action of the jurors themselves in defying the judge, were certainly seen to be unusual. But it is not clear whether this was part of a general trend, or just something that happened from time to time and was always thought odd. These various ways of using the criminal law were a reflection of tensions and relationships in society. This is another aspect of the Witham fires which is made possible by the detail and survival of the records. Some examples were discussed in Section 3. One was the lack of communication and understanding between local and national figures. This is a perpetual problem, as is the fact that figures like Western who appear to bridge the gap may not do so very effectively in practice. But there were particular problems which aggravated matters in the 1820s, such as the fact that the Home Office and Robert Peel were pre-occupied with three other issues, namely Catholic Emancipation, the unrest in the northern counties, and a desire to restrict the pace of real law reform. The relationship between the poor and the prosperous was also under particular strain in the 1820s, under the effects of rapid population increase, changing agricultural practices, fluctuating wheat prices, and a severe reduction in poor relief payments. This meant that whether or not any of the fires were in fact ‘caused’ by the effects of the Poor Law, the comments they provoked suggest that it would have been no surprise if they had been. These comments also illustrated the complete discrepancy of view between those like the MP Western who thought the poor fairly treated, and those like Robert Ling who wished to see the overseer in the flames. William Luard’s ineffectiveness in petitioning for the life of James Cook, illustrates both these tensions in society. He was not able to break through the indifference of national figures to local concerns, and Western did not share with him his concern for the poor and the unemployed. Lastly, the detail of the Witham fires can illuminate the minute workings of a local community. Normally, Witham people, in common with those of most parishes, would probably concentrate their prosecuting activity on people from other places. Their own fellow-inhabitants would be controlled by more subtle means. It was only unusual threats to local equilibrium which led to the criminal law being called upon for assistance. One of these threats was the alarm of the Witham fires themselves. Another was the introduction of an economic system, namely the brushmaking yard, outside the customary one of farming and trade; not only did this introduce outside workers on relatively high wages, but it was probably associated with an alien religious movement, namely Methodism. This set of threats to society may have little direct bearing on the fires themselves in that there is no evidence of it being an actual cause of arson. But it is an example of how a particular feature of a local community can be revealed by the exceptional reaction and rate of reporting which an incident like the fires provoked. Like many other aspects of the incident itself and the local society of the time, it leaves one wanting to know more. Hopefully there were other remarkable incidents in other areas that might be equally illuminating, and that might one day reveal their secrets. Many people gave help and encouragement during the preparation of this study, both in its original form as a dissertation in 1982, and as it appeared in booklet form in 1991. Exceptionally supportive were Arthur Brown, Leonore Davidoff, Peter King, Betty Loring and John Walter. Rickstones School drama department provoked me to additional interesting discoveries by their portrayal of the story of James Cook. My family also helped in many ways; for instance John understood the trials of an author, and Phil and Susie made artistic and dramatic contributions respectively. I am very grateful indeed to all of these, and to all my friends. Without them I am sure I should not have had the determination to make my own contribution, which was, to paraphrase P G Wodehouse, the application of the seat of the pants to the chair. J Gyford, Men of Bad Character: Property Crime in Essex in the 1820s , (Essex University MA dissertation, 1982). This described and discussed property crime in Essex as a whole, using the Witham fires as the main example. The version in the published booklet (reproduced in this web version) drew on research carried out for the dissertation, as indicated in the footnotes where appropriate, but also had some new material. J Gyford, Images of England: Witham , Tempus, 1999, reprinted 2002, and History and Guide: Witham, Tempus, forthcoming. For general history of Witham (these have been published since the dissertation and booklet version of Men of Bad Character). P J R King, Crime, Law and Society in Essex 1740-1820 , (Cambridge University PhD thesis, 1984), and P J R King, ‘Decision-makers and decision-making in the English Criminal Law, 1750-1800’ in Historical Journal, 27, 1984. Both deal primarily with Essex, in the period immediately preceding the 1820s, and so provide an invaluable background. C Emsley, Crime and Society in England 1750-1900 , Longman, London, 1987. One of the only ‘overviews’ of the subject. Being relatively recent, it includes most of the other relevant works in its section on ‘Further Reading’. D Philips, Crime and Authority in Victorian England , Croom Helm, London, 1977. Deals with the period following that of the Witham fires, and includes a particularly useful account of the progress of a suspect through the legal process. L Radzinowicz, A History of the Criminal Law and its Administration from 1730 , Stevens, 1948-1986, especially volume i, The Movement to Reform, and volume ii, The Clash between Private Initiative and Public Interest in the Enforcement of the Law. The basic work on the subject; more readable than it looks and sounds, and also includes lists of the relevant Acts of Parliament etc. A Charlesworth (ed), An Atlas of Rural Protest in Britain 1548-1900 , Croom Helm, London, 1983. The most recent, and one of the most detailed, of the works on this subject; it includes its predecessors in its notes and references. N Rowley, Law and Order in Essex 1066-1874, N. Rowley, Relief of the Poor in Essex , and R G E Wood, Essex and the French Wars 1793-1815, Seax Series of Teaching Portfolios, Essex County Council, Chelmsford, 1970, 1971 and 1977. Give illustrated information of these relevant subjects in an accessible form. A F J Brown, English History from Essex Sources 1750-1900 , Essex County Council, Chelmsford, 1952, and A F J Brown, Essex at Work 1700-1815, Essex County Council, Chelmsford, 1969. Still the standard works on Essex history in the period, and essential background reading. A F J Brown (ed), Witham in the 18th Century , W E A, Witham, 1963. Gives helpful background to the town. L Davidoff and C Hall, Family Fortunes: Men and Women of the English Middle Class 1780-1850 , Hutchinson, London, 1987. Uses Witham as one of its case studies, and elaborates on the social and religious character of some of the prosecuting classes. Select Committee on the cause of increase in the number of criminal commitments and convictions: report of minutes of evidence , PP 1826/7 (534) vi 5, and PP 1828 (545) vi 419. Number of magistrates in England and Wales , PP 1831/2 (39) xxv 231. Select statement of the number of persons charged with criminal offences during the last seven years , PP 1830/1 (308) xii 493. The main records used for information on the Witham fires were: PRO HO 13/52 (correspondence), HO 17/108 Vn 36 (petition of James Cook including copies of Assize depositions), HO 9/8 (register of convicts, Leviathan), HO 10/29 (list of arrivals, New South Wales). For background information the following in particular were consulted: PRO HO 19/4, 19/5 (registers of petitions), HO 17 (petitions), HO 40/18, 40/23 (correspondence, disturbances), HO 64/1 (correspondence, rewards), HO 75/2 ( Hue and Cry ), HO 52 (in-letters, JPs). See Guide to the contents of the Public Record Office , i, HMSO, London, 1963, for an account of these records, and J Gyford, Men of Bad Character: Property Crime in Essex in the 1820s , (Essex University MA dissertation, 1982), appendix 2, for their relevance to the 1820s. The main items which have not survived are the depositions, except in a very few cases. A few matters concerning the Assizes, such as expenses, were dealt with by Quarter Sessions. The main documents used were PRO ASSI 35/264 and 35/269 (Essex indictment rolls, including calendars and jury lists as well as the indictments for each case endorsed with the verdict), ASSI 31/24 to 31/26 (Home Circuit agenda books), and ASSI 32/7 and 32/8 (Home Circuit minute books). See F G Emmison, Guide to the Essex Quarter Sessions and other official records , Essex Archaeological Society, Colchester, 1946, and F G Emmison, Guide to the Essex Record Office , Essex County Council, Chelmsford, 2nd ed, 1969, for an account of these records, and J Gyford, Men of Bad Character: Property Crime in Essex in the 1820s , (Essex University MA dissertation, 1982), appendix 2, for their relevance to the 1820s. Their survival is very full, except for the absence of most of the pre-Session informal calendars which gave ages and informal occupational descriptions, until after 1860. For basic information about cases, the records most used for the present study were ERO Q/SMc 3 and 4 (gaol calendars), Q/SPb 19 and 20 (process books), Q/SR 995-998 and 1015-1020 (rolls). More detail for the Witham area was obtained from Q/SBb 474-477 and 494-497 (bundles), Q/SBd 4/1 to 4/6 (depositions), Q/SMr 5 & 7 (recognisance books). A variety of other Quarter Sessions records were used for other information, including ERO Q/SMg 33 to 36 (minute books), Q/SO 28 to 31 (order books), Q/FAa 4/4 and 4/5 (accounts), Q/FAa 6/1 (abstract of accounts), Q/FAb 89/2 to 89/8 and 94/2 to 95/2 (bills and vouchers), Q/CR 7/1 (return of peace officers), Q/JL 8, 9, 9A and 10 (lists and correspondence concerning magistrates), Q/RJ 1/12 and 2/1 (jury lists), ERO Q/RSc 1/1 to 1/3 (summary conviction books). ERO P/WM 1 to 4, Minutes of Witham Petty Sessions, were used for other information about summary justice. Chelmsford Chronicle (its sister paper, the Essex Herald , would also have been helpful, but at the time of writing the dissertation and booklet did not appear to have survived for the relevant period. I believe that there are now some copies at ERO). BL Add MS 40344-40428, general correspondence of Robert Peel, and BL Add MSS 40299-40300, correspondence of Robert Peel with George IV. ERO D/DBs F38, journal of a Witham farmer, 1846-48. H N Dixon, Reminiscences of an Essex country practitioner a century ago , in Essex Review, xxv, 1916. ERO D/CT 405A and 405B, tithe map and award, Witham, 1839. ERO D/P 30/1/4, 30/1/7, 30/1/9, 30/1/13, parish registers. ERO D/P 30/12/10, 30/12/11, 30/12/13, 30/12/14, overseers’ accounts. ERO D/P 30/8/2, vestry minutes, and D/P 30/8/13, notices of appointment of Select Vestry. ERO D/NC 3/2, Minutes of Witham Independent Meeting. ERO D/NM 5/1/11, Missionary Account Book, Chelmsford Methodist Circuit, 1831-47, and D/NM 5/1/13 and 14, Circuit Schedule Books, 1839-65. A F J Brown. English History from Essex Sources 1750-1900 , Essex County Council, Chelmsford, 1952. A F J Brown, Essex at Work 1700-1815 , Essex County Council, Chelmsford, 1969. V A C Gatrell and T B Hadden, ‘Criminal statistics and their interpretation’, in E A Wrigley (ed), Nineteenth Century Society: Essays in the use of Quantitative Methods for the Study of Social Data , CUP, Cambridge, 1972. P J R King, ‘Crime, Law and Society in Essex 1740-1820’, (Cambridge University Ph D thesis, 1984). Summary statement of the number of persons charged with criminal offences during the last seven years , PP 1826/7 (235) xix, 183. Summary statement of the number of persons charged with criminal offences during the last seven years , PP 1830/1 (308) xii, 493. J P B Dunabin, Rural Discontent in Nineteenth Century Britain , Faber and Faber, London, 1974. A Charlesworth (ed. ), An Atlas of Rural Protest in Britain 1548-1900 , Croom Helm, London, 1983. L Radzinowicz, A History of English Criminal Law and its Administration from 1750 , vol i, The Movement for Reform, Stevens, London, 1948. An act for consolidating and amending the laws relating to jurors and juries , 6 Geo 4, c 50, 1825. An act for repealing various statutes in England relative to the benefit of clergy and to larceny and other offences connected therewith and the malicious injuries to property and to remedies against the Hundred , 7 & 8 Geo 4, c 27, 1827. An act for further improving the administration of justice in criminal cases in England , 7 & 8 Geo 4, c 28, 1827. An act for consolidating and amending the laws in England relative to larceny and other offences connected therewith , 7 & 8 Geo 4, c 29, 1827. Select Committee on the cause of increase in the number of criminal commitments and convictions: report of minutes of evidence , PP 1826/7 (534) vi, 5. Select Committee on the cause of increase in the number of criminal commitments and convictions: report of minutes of evidence , PP 1828 (545) vi, 419. Royal Commission of Inquiry into the administration and practical operation of the Poor Laws: report and appendices , PP 1834 (44) xxvii.1 to xxxviii.1, 251, 313, xxxix,1. Publications which have become available since Men of Bad Character was originally prepared include two illuminating works by A F J Brown, Meagre Harvest: the Essex Farm Workers’ Struggle Against Poverty, 1750-1914 , ERO, 1990, and Prosperity and Poverty: Rural Essex 1700-1815 , ERO 1996. In 1991 there was no comprehensive history of Witham. By 2004 there was J Gyford Images of England: Witham , Tempus, 1999, reprinted 2002, and History and Guide: Witham , Tempus, forthcoming. A F J Brown (ed), Witham in the 18th Century , Workers’ Educational Association, Witham, 1963. M L Smith, Early History of Witham ; Markets, Manors and Manorial Rolls ; St Nicolas Church ; Postal History of Witham ; Witham Schools ; Witham River Bridges ; Witham Roads ; Fires in Witham , privately published, Witham, 1970 to 1975. The brush shop was at what is now no 67 Newland Street, and the yard and other buildings were approached through the arch between no 67 and no 83 (p 47 of volume of ‘Press cuttings, Witham’, which was in Chelmsford Library in 1991 but is now (2004) in ERO, Accession 10510). ERO D/P 30/8/2, 30/8/13, 30/12/6 to 30/12/14. Chelmsford Chronicle , 7 & 14 November, 1828. The tithe map shows John Crump as occupier of Freebornes Farm (now no 3 Newland Street). ERO D/P 30/28/5 gives him as an Anglican. R C Fowler, The Church of St Nicholas, Witham , Wiles, Colchester, 1911, shows that he became a churchwarden in 1837. S W Amos, ‘Social discontent and agrarian disturbances in Essex 1795-1850’ (Durham University M A thesis, 1971). Chelmsford Chronicle , 5 December 1828. The tithe map gives William Wright Luard as occupier of Witham Lodge (the area of its ground is now occupied by the Witham Lodge estate, off Hatfield Road). Chelmsford Chronicle , 5 & 12 December 1828. Chelmsford Chronicle , 9, 16, 23, & 30 January 1829. Chelmsford Chronicle , 20 & 27 February 1829. The newspaper report gives the fire in William Whale’s premises as being in a field near Sauls Bridge. ERO Sale Catalogue B1327 gives Whale as owner of Upper and Lower Sauls, so the fire has been mapped approximately where these were according to the tithe map. Pigot’s Directory, Essex, (1823/4 and 1826/7) shows that William Whale’s Inn was the Blue Posts. The tithe map shows this to have been at what is now nos 126/28 Newland Street. ERO P/WM 4, minutes of Witham Petty Sessions. entry for 25 February 1829. ERO D/P 30/12/12, 30/12/13, 30/12/14. PRO HO 17/108 Vn36, petitions, James Cook. This contains copies of the depositions in the case, which are most detailed and interesting. They highlight the great losses arising from the fact that practically all original Assize depositions have been destroyed. Chelmsford Chronicle , 14 August 1829. Pigot’s Directory, Essex (1823/4 and 1826/7), gives Hoffgaard Shoobridge as a miller. 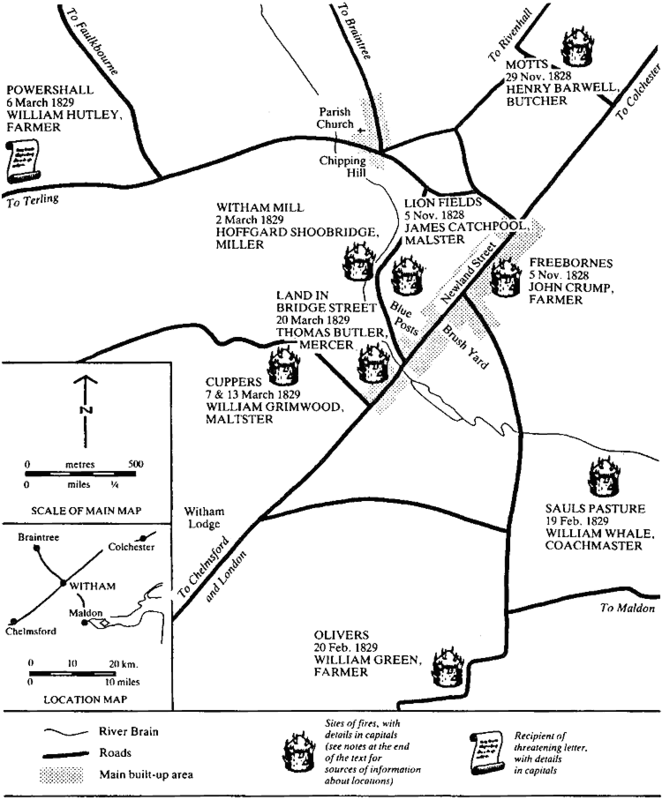 The tithe map shows Thomas Hoffgaard Shoobridge at Witham Mill (now the Old Mill House, Guithavon Valley). So the fire on Shoobridge’s premises has been shown at this site on the map, though he is known to have held other property (e.g. see ERO T/P 198/5, ERO D/DBw M39). ERO D/NF 1/2/17 gives him as a Quaker. ERO D/P 30/28/5 gives William Hutley as an Anglican. PRO HO 17/108 Vn36, petitions, James Cook. Chelmsford Chronicle , 27 March, 3 & 10 April 1829. ERO D/NC 3/2 shows Robert Ling as a member of the Independent meeting. ERO D/P 30/12/10, 30/12/11, 30/12/12, 30/12/13. Chelmsford Chronicle , 17 & 24 April 1829. ERO D/NC 3/2 shows William Potto and James Thomasin as members of the Independent meeting. ERO D/P 30/1/3, 30/1/4, 30/1/7, 30/1/9 (parish registers of Witham), D/P 259/1/6 (marriage register of Southminster, Essex), PRO RG 4/1385 (register of Witham Independent meeting), and the baptism register of Hadleigh, Suffolk, show the relationships between the families mentioned. Edmund Potto was baptised in 1807 in Hadleigh during the temporary residence there of his parents. Information on his appearance from Family History Centre, Kiama, New South Wales. See note 13 for the brush shop and yard. ERO D/NF 1/2/17 gives James Catchpool, Hoffgaard Shoobridge and Josiah Marten Sanders as Quakers in 1829. Information from Family History Centre, Kiama, New South Wales. E.g. D Hay, P Linebaugh and E P Thompson (eds), Albion’s Fatal Tree: Crime and Society in Eighteenth Century England , Allen Lane, London, 1975, especially the essay by D Hay, ‘Property, authority and the criminal law. J Brewer and J. Styles (eds. ), An Ungovernable People: the English and their Law in the Seventeenth and Eighteenth Centuries , Hutchinson, London, 1980. J Sharpe, ‘Enforcing the law in the seventeenth century English village’, in V A C Gatrell, B Lenman and G Parker (eds), Crime and the Law: the Social History of Crime in Western Europe since 1500 , Europa, London, 1980. See J Gyford, dissertation, fig 19, for an analysis of the status of parish constables in the Witham Division. ERO P/WM 3, minutes of Witham Petty Sessions, minute for 30 December 1828. John Crump, farmer, Thomas Butler, grocer and farmer, and Henry Barwell, butcher, had fires, and William Hutley, farmer, received a threatening letter. The other special constables were: Edward Aldridge, farmer and tanner; James Beadel the elder, builder; James Beadel the younger, auctioneer and surveyor; Charles Barwell, butcher; John Cutts, solicitor; and William Nash, chemist, druggist and spirit merchant. Chelmsford Chronicle , 12 December 1828. ERO D/P 30/8/2, vestry minutes, minute for 22 October 1829. M L Smith ( Fires in Witham , privately published, Witham, 1975) shows that a similar arrangement had operated with the old engine, which had been donated by the Royal Exchange Insurance Office, but was housed in a building provided by the vestry in 1806 on Gallows Croft, which was at the east end of Newland Street, near where the Roman Catholic Church stood until recently, opposite what are now Grove Cottages. ERO D/DBw M39, entry for 2 November 1807, indicated the location, and also shows that the building was built on waste, i.e. in the roadway, and only measured 14 ft by 15 ft. The new engine of 1828 was still a manual one; the first steam fire engine in Britain was constructed in 1829 but they did not come into use in this country until the 1860s (A Ingram, A History of Fire-Fighting and Equipment , New English Library. London, 1978). The building provided in 1829 was probably near the old one, but adjoining rather than opposite Grove Cottages (deduced from the description of enumeration district 1b in Census returns, 1951, and of district 11 in the districts of the Witham Congregational Christian Instruction Society in 1848, quoted in M L Smith, A Brief History of Witham Congregational Church , privately published, Witham, 1965). Calculated from descriptions in such documents as depositions, ERO Q/SBb 494 to 497, and Q/SBd 4/1 to 4/6. Calculated from ERO Q/FAa 6/1, Abstracts of the accounts of the county treasurers 1819-60 . Details of prosecutors’ expenses for both Assizes and Quarter Sessions are in the Quarter Sessions bills and vouchers in the class ERO Q/FAb. Calculated from PRO ASSI 35/264, 35/269, 31/24, 31/25 and 31/26, ERO Q/SMc 3 and 4, ERO Q/SR 995 to 998, and 1015 to 1020. An ‘acting’ magistrate was one who had taken out a writ of ‘dedimus’ enabling him to function. In Essex only about half the commissioned magistrates appear to have done this. Figure for England and Wales calculated from Number of magistrates in England and Wales , PP 1831/2 (39) xxxv 231. See J Gyford, dissertation, fig 4, for information on the activity of magistrates in the Witham Division. PRO HO 52/5, in-letters, JPs, letter of 17 April 1829, includes a printed card of intended meetings of the Witham bench in 1829, and a letter of complaint from the parish officers of Wakes Colne about the non-attendance of the magistrates. E.g. in the case of Richard Everett and Daniel Wade, aged 13 and 11, convicted of stealing a fowl at Coggeshall in 1829, the judge ‘recommended them to mercy on account of their youth’ ( Chelmsford Chronicle , 20 March 1829). PRO HO 17/108 Vn 36, petitions, James Cook. Select Committee on the cause of increase in the number of criminal commitments and convictions: report of minutes of evidence , PP 1826/7 (534) vi 5. An act for further improving the administration of justice in criminal cases in England , 7 & 8 Geo.4, c 28, 1827. BL Add MS 40390, f 131. PRO HO 40/23, correspondence, disturbances, letters dated 7 January and 17 January 1829 from the Revd Thomas Jee and the Revd Lewis Way respectively, to the Home Office. PRO HO 17/108 Vn36 petitions, James Cook. N Gash, Mr Secretary Peel , Longman, London, 1961. The Assize information about suspects’ occupations comes from the printed calendars; these did not have any legal status, so did not have to be so meticulous in their wording as the indictments. The latter always used the description ‘labourer’ for the suspects, and this does not seem to have been questioned (PRO ASSI 35/264 and 35/269). The Quarter Sessions information about prosecutors’ occupations is calculated from the Recognisance books (ERO Q/SMr 5 and 7). ERO P/WM 3, minutes of Witham Petty Sessions, minute for 4 November 1828 about John Edwards. ERO Q/SBd 4/1, information of Thomas Potter in the prosecution against Matthew Nicholls. A F J Brown, English History from Essex Sources 1750-1900 , Essex County Council, Chelmsford, 1952. Information from Arthur Brown on these points has been most helpful. Wheat prices from A D Gayer, W W Rostow, and A J Schwartz, Economic Fluctuations in the British Economy 1790-1850 , OUP, Oxford, 1953 (microfilm supplement). Dates of offences from PRO ASSI 35/264 and 35/269, ERO Q/SR 995 to 998 and 1015 to 1020, ERO Q/RSc 1. Royal Commission of Inquiry into the administration and practical operation of the Poor Laws: report and appendices , PP 1834 (44) xxvii 1 to xxxviii 1, 251, 313, xxxix 1. Average annual wheat prices from Lord Ernie, English Farming Past and Present , Longman, London, 5th ed., 1936. Select Committee on Poor Rate returns , supplemental appendix to report, PP 1822 (556) v (517). Select Committee on Poor Rate returns , appendix to report, PP 1825 (334) iv 39. An account of the money expended for the maintenance and relief of the poor in every place in England and Wales , 1824-1829, PP 1830/1 (83) xi 227. An account of the money expended for the maintenance and relief of the poor in every place in England and Wales , 1830-1834, PP 1835 (444) x1vii 185. Calculated from Select Committee on Poor Rate returns, appendix to report , PP 1825 (334) iv 39, and An account of the money expended for the maintenance and relief of the poor in every place in England and Wales, 1824-1829 , PP 1830/1 (83) xi 227. At Quarter Sessions the median value of stolen goods for which farmers prosecuted was 4 shillings (20p), for tradesmen it was 9s 6d (47_p), and labourers 5 shillings (25p) (calculated from ERO Q/SMr 5 and 7). Census returns, 1841, include in Witham 11 people described as brushmakers, mopmakers or pattenmakers (plus James Thomasin himself and his son George), 21 as journeymen, and one apprentice. A F J Brown, Essex at Work 1700-1815 , Essex County Council, Chelmsford, 1959, chapter viii. George Thomasin’s house was what is now Roslyn House, no 16 Newland Street (judged from situation in Census returns, 1861, and confirmed by ERO D/DBw M59, which has him in 1856 owning and occupying part of the property numbered 44 in the records of the manor of Newland. This part can be identified as no 16 Newland Street by tracing it to later manorial records). Essex Weekly News , 3 January 1908. N Rowley, Law and Order in Essex 1066-1874 , Seax Teaching Portfolio, Essex County Council, Chelmsford, 1970.